So here’s how you can make it! 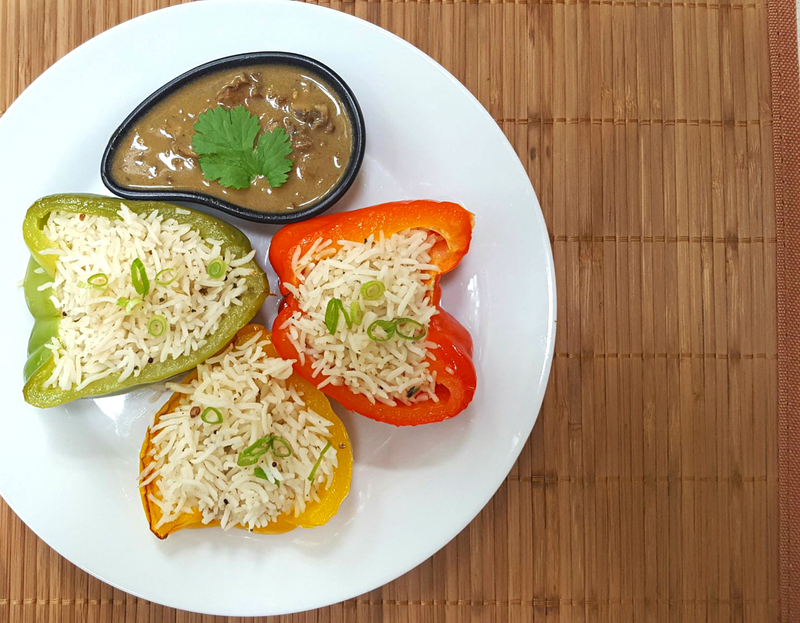 Stuffed Peppers with @Tilda Aromatic Spices Rice and Thai Mushroom Sauce. 1.Set your oven to 200 deg C and put the pepper halves (open side down) on a baking tray and drizzle with olive oil. Bake these for about 20 mins or until softened. 2.While the Peppers are in the oven you can make the Thai Mushroom sauce. Grind the ginger, Garlic and chilli into a paste. In a saucepan heat some oil and then add both types of mushrooms and then the Ginger, Garlic, Chilli paste. Mix well and add some salt to taste. Do make sure you cut the mushrooms as finely as you can as otherwise you will end up with big lumps in your sauce. 3.After the mushrooms have cooked down, add the coconut milk and simmer for about 5 mins. Check for seasoning and then take the pan off the flame. Add the Lemongrass @HolyLama spice drop (if using) and then mix well. Garnish with the chopped coriander leaves. The @HolyLama spice drops definitely add the authentic Thai flavour needed for the sauce so do try and get a hold of it. They last for ages! 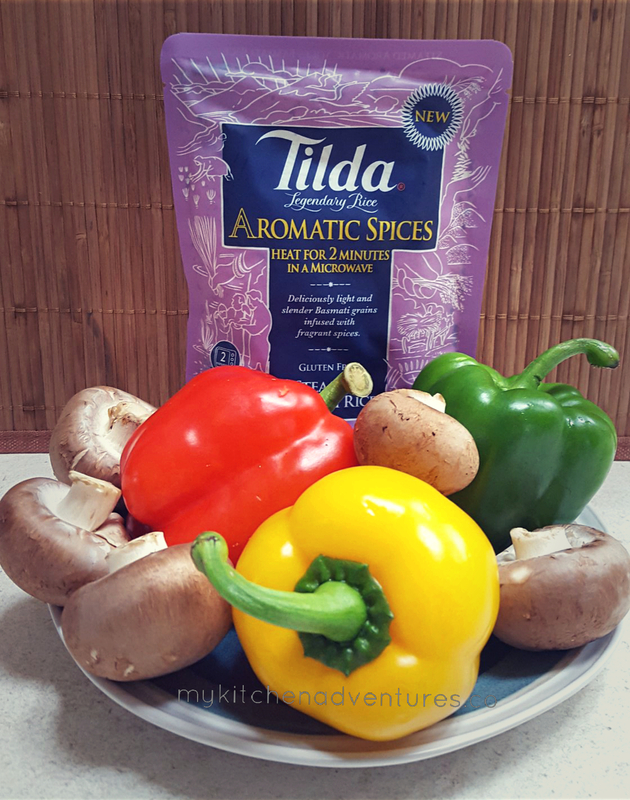 4.Make your @Tilda Aromatic Spices Rice according to the instructions on the packet and then stuff the softened Peppers so that they are filled in well and then garnish with spring onions. You can serve with the Thai Mushroom sauce on the side or drizzled over the stuffed Peppers. Finally something worth posting about! In this last section of my posts, I hope to inspire you with foodies that have inspired me! This section maybe about articles related to food and nutrition, food bloggers, organisations or just anyone who has given me inspiration and pause for thought. OMG there is so much going on out there!!! I am very lucky indeed to have foodie friends and even luckier to be gifted a cooking class for my birthday this year! 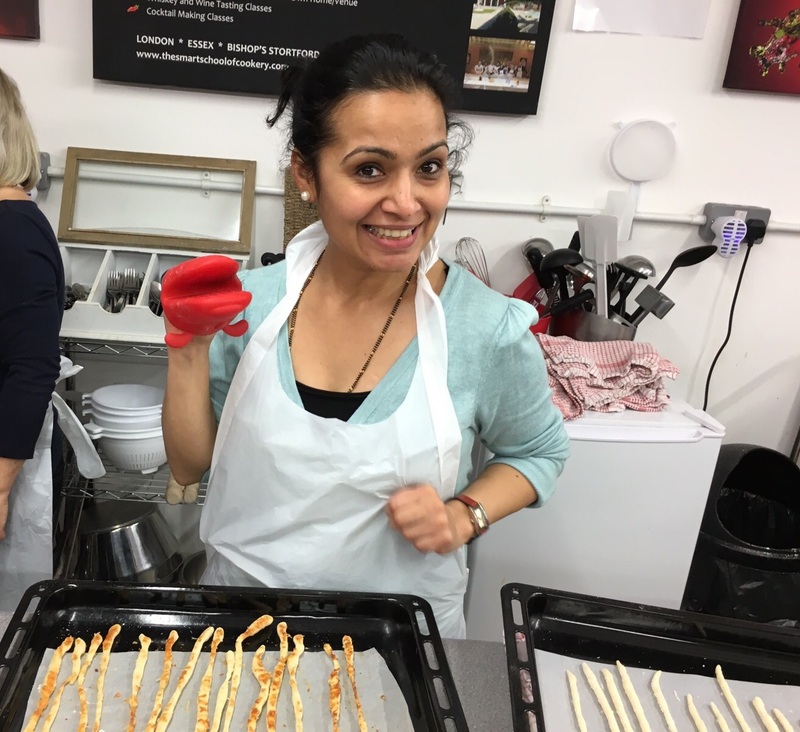 The lovely Dharani and I went on a baking class at Ann’s Smart school of Cookery and this class was held at their branch in St Katherine’s Docks in London. It was a dreary day in London so it was nice to walk into a cookery class which starts with the enticing smell of yeast! It’s a small venue but just enough to fit in the 20 people who signed up and a great long industrial kitchen tables for us to sit around. The class started off with an introduction with our Tutor, Stuart, who was very charming and explained the plan for the day. 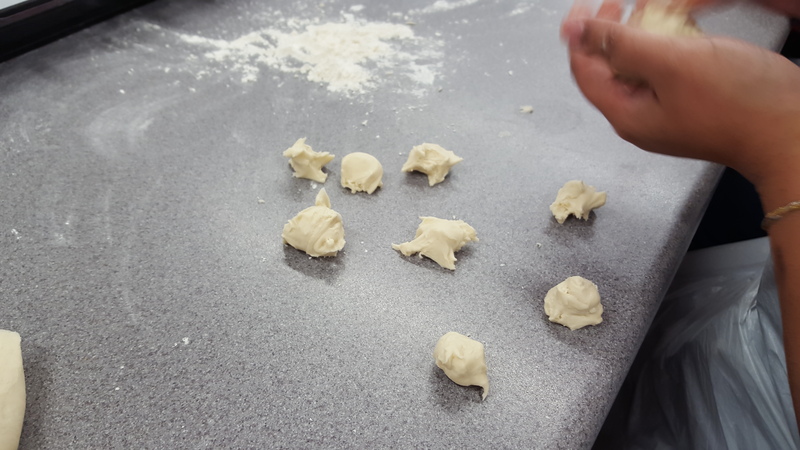 It was interesting to learn a different type of making a standard dough which involves adding the flour to the liquid and not the other way around. It was a revelation for me and I am looking forward to trying it out for myself at home! We started off with the Brioche and the dough was given to a pair of participants who very ably used this ‘introverted technique’ of bread kneading and the ingredients put into this enriched dough had such an amazing aroma! YUM! Surprisingly the same basic dough was used to make all of the breads, with adjustments only made for any added ingredients e.g. herbs, spices and olives for the Foccacia. 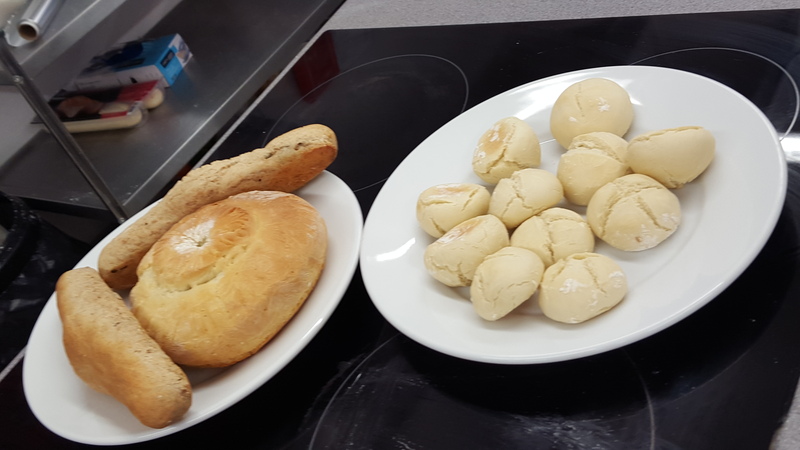 Some of the different breads made by various participants on the class. Myself and Dharani had the awkward task of making 30 identical crostini’s. It was arduous work and mine were so untidy compared to the lovely ones Dharani made! However it was worth it in the end and they were so yummy with the different dips we had to sample them with. 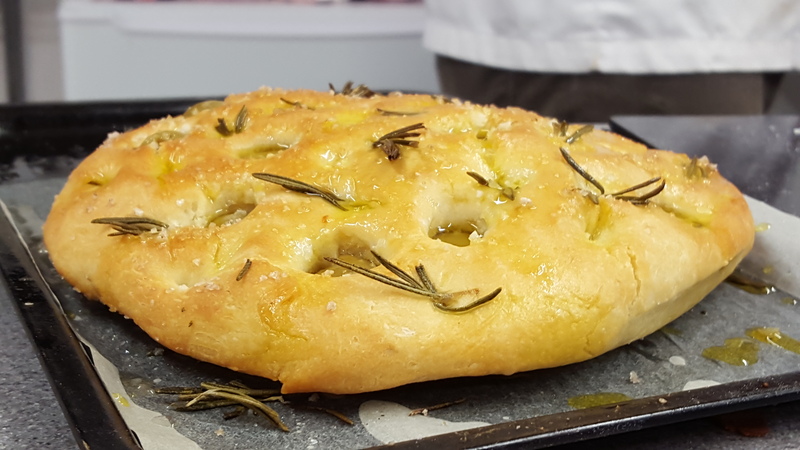 The other participants on the class that day had other types of bread to make; pizza, cob, foccacia and seeded rolls. It was amazing to see such soft bakes turn out so well with very little time for proving. But I guess that’s what happens when you have a bread making class for only 2.5 hours! 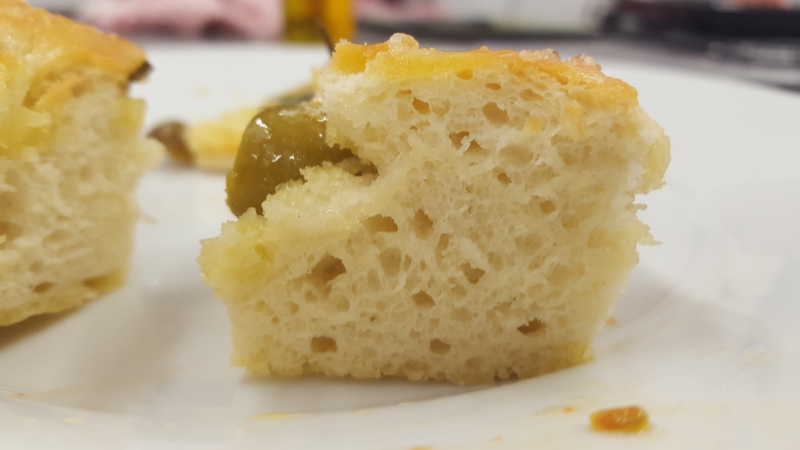 Check out the air bubbles in this soft and pillowy Foccacia! Tear n Share rolls. 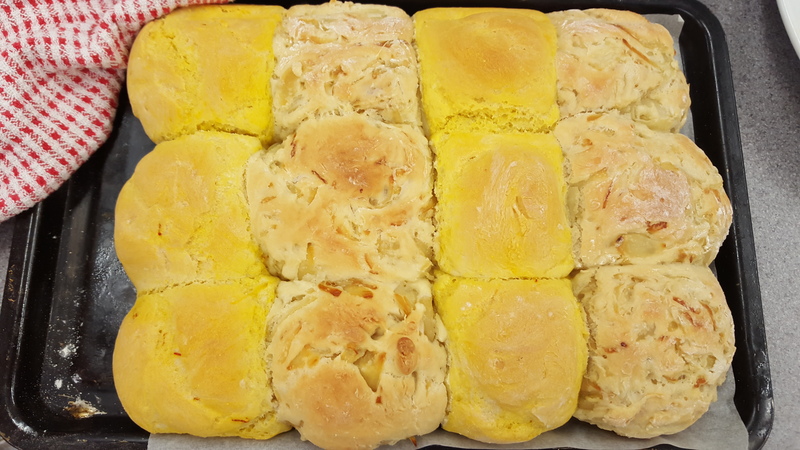 I want to try out those saffron rolls – beautiful colour! 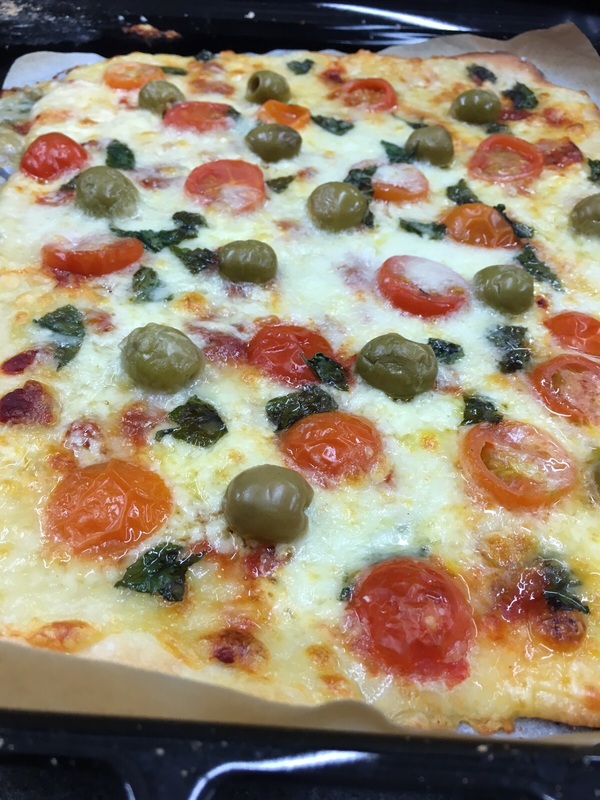 What the course details do not explain on the website is how much of the baking we will be doing ourselves and I think that it something that I would have liked to know beforehand. In my opinion this class is for beginners to baking or for those who would like to be inspired. 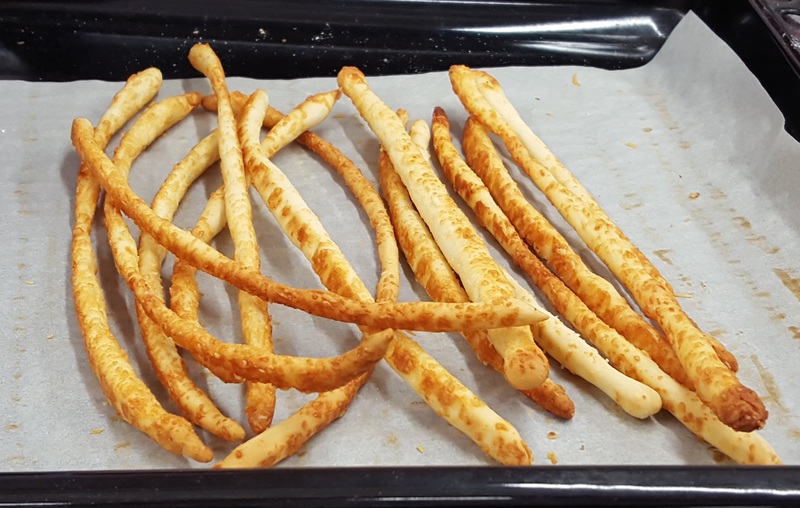 If you bake often and are seeking specialty bakes, then perhaps this is not the class for you. However, the school has many different types of classes and you can book here. I have yet to experiment with the techniques that I learnt on the class, so watch this space for new bread recipes! But click HERE for my classic white loaf recipe that I use very often and can be adapted with different ingredients.